colored up this monster for my brothers birthday present, which was yesterday! i just needed one more day to finish up the background. i am totally in love with this one. The Incredible Hulk looking as powerful as ever with hands at the ready, to munch evil!! Great color scheme, vibrant yet equally as intense. Ooo. I like this art style. Very unique. Excellent, really love your take on the Hulk! Pops like f***! this is my new desktop. This is great, it perfectly captures the intense rage that I think is so crucial to Hulk's character. 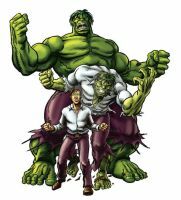 This is great, it captures what I think the Hulk is all about, the pure, uninhibited rage. That intense look he has is what really makes this amazing for me. SICK MAN! so in your face and the colors are insane friggn awsome bub! hey man, I want to use this on my arcade stick if you dont mind. IT'S AWESOME!!!! This is frickin sweet although I have to say I don't like the face all that much... Hulk is a great character but I think the face can either make or ruin it! The body on this and the BG is amazing though!! Good job and hope your bro liked it! yeah i totally agree with you on the face (not on mine though!). usually i see artists do hulk and the face is the one thing i tend to critique the most. i didn't want to try to do a face that wasn't the way i wanted it just to please hulk fans, so i did what i thought matched my style. i appreciate the comments! Your art should be for your own pleasure so it's great that you like it the way it is! It's good no matter what and as I said it was only my personal feelings. Great job either way bro hope to see more!! THIS IS SO FREAKIN AWESOME DUDE HOW DO U DO THAT!!!!!!!!! Do a Green Goblin One! oh i will, not sure when but i like the green goblin so he's definitely on my list. iron man and captain america are coming up next so look out! thank you!! im glad to know that you find me funny!! That is mega super awesome to the extreme times two. Did you pick up Marval Ultimate Alliance 2? my roommate did cause i only have a wii, so he got it on xbox and it's amazing. what about you? Sure did and unlocked the Hulk yesterday. I love it. thanks man, i have iron man cookin up next and after that i might take a short break and jump into a different series for a bit, any ideas?